Just about everyone is familiar with the top-tier wireless service providers in Verizon, AT&T, T-Mobile, and Sprint. They’re the so-called “Big Four” and they seem to collectively own the space. It’s not uncommon to assume this is pretty much all there is when it comes to purchasing phones with wireless service. That’s hardly the case. For every one of the major network operators listed above there are a number of other players in the space. These smaller fish operate using the towers and infrastructure from the big names but offer their own rates, customer service, and phone selection. These Mobile Virtual Network Operators (MVNOs) include the likes of Metro, Boost Mobile, and Cricket Wireless. These brands license towers from T-Mobile, Sprint, and AT&T, respectively. Let’s take a look at one of them in particular: Cricket Wireless. Cricket Wireless (Cricket) initially launched in 1999 and is a US-based prepaid wireless service provider; it’s a wholly owned subsidiary of AT&T. It offers its own lineup of GSM phones, many of which are also found at other carriers. PODCAST: What is an MVNO? Cricket rate plans are no-contract, meaning you can go month-to-month with no long-term agreement or cancellation fees. Moreover, they do not charge for going over your allotted data and taxes are included in the cost. It’s worth reinforcing here that this is not the high-speed 4G LTE stuff you might expect. Rather, you’ll find it’s capped at 3Mbps speeds. This may be more than sufficient for many of you, especially if you’re not primarily using your phone for watching streaming videos. 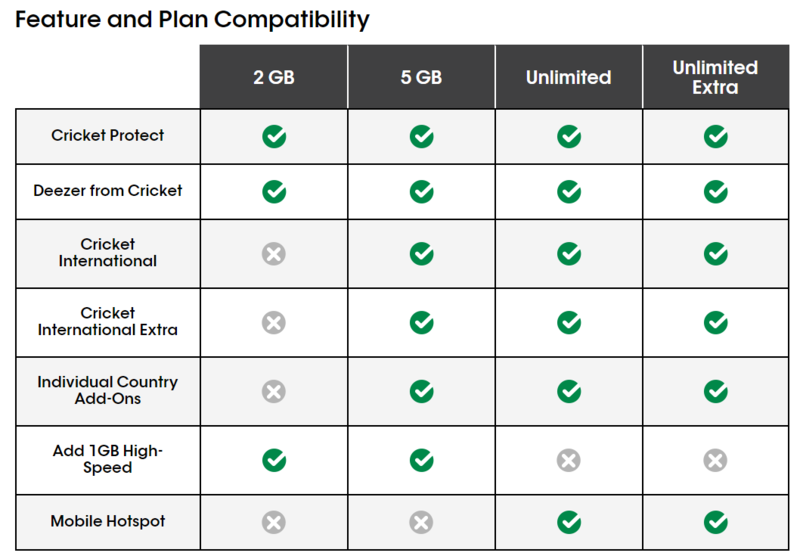 Cricket offers a handful of other options to its customers, most of which can pair with the aforementioned rate plans. Details here include international calling, insurance against lost and stolen phones, extra data, and on-demand music service Deezer. For those on the $40 and up plans, a mobile hotspot option lets you share your data connection. Taking a look at the current lineup of phones offered through Cricket we find familiar names from brands like LG, Samsung, and Motorola. There are also devices from the likes of Alcatel, Coolpad, and ZTE, too. As is the case with many prepaid providers, selection is a mixed bag and skews more toward affordability versus power. With that said, we do recognize there are some incredibly robust devices, including the Samsung Galaxy S9. If you’re in the market for a new phone under Cricket, be sure to check out our guide on which devices are the best. You can often use your current GSM phone, especially if it was previously paired with AT&T. Head to Cricket’s website to check whether your specific model is supported. You’ll want to ensure that your phone is unlocked prior to purchasing the SIM card kit currently priced at just $10.